The Warkworth Group, Margaret and Roselda forefront. This year it was held at Lake House, and over a short five day period. Thanks have to go to the small group of members who worked so hard to deliver this event to us all. On this blog you will see photos of only a small selection, which have been divided into sub groups, although in the gallery the works mingled. Glenice and Al, Peter and Tom, Dale and Gill. 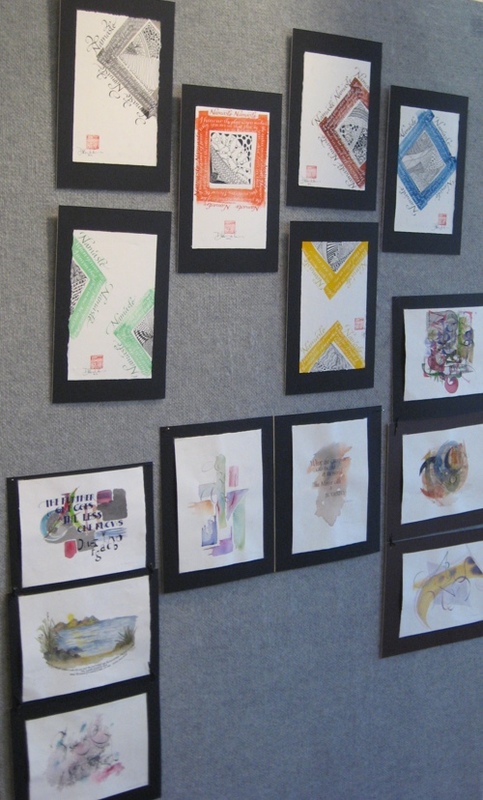 Art Works: Nearly 20 members participated in supporting the call for submissions, and many had multiple works for sale. Beginners, intermediate and advanced members worked hard to create for the exhibition, it was wonderful to see the skill and range of abilities. 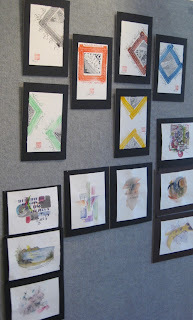 There is no way I can do justice to the individual art works but below are a few snapshots of the work after hanging in the gallery. 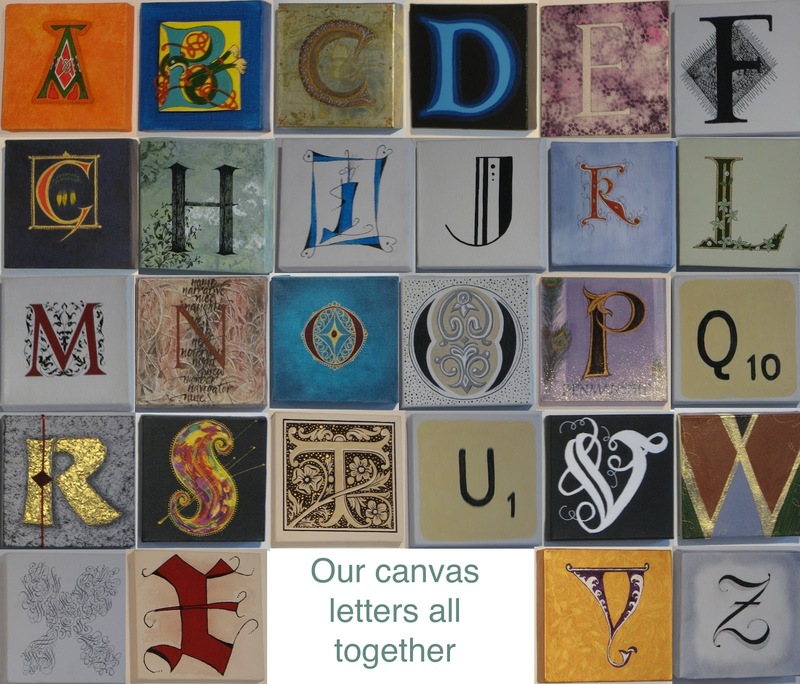 The Alphabet on Canvas: The Society purchased 6" square blocks, covered in canvas and primed. They were offered to old and new members who were to decorate with a given letter in any style they chose. These were all for sale with proceeds going to the society. Making A Mark: Small similar works, where each was added to over a period of time, building up to a final image. 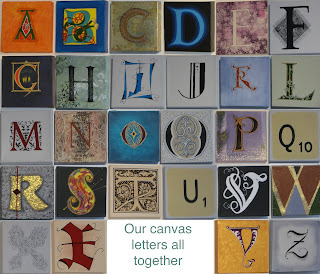 This was open to all levels of calligraphers. Dale's work immediately above, Glenice's below. 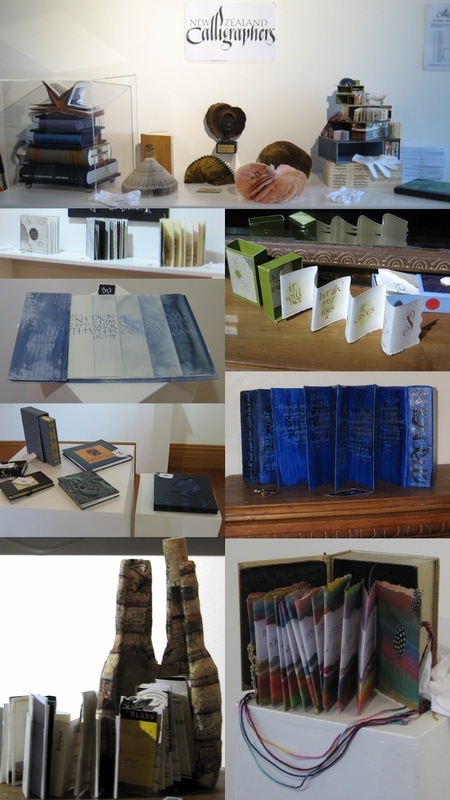 Book Artists: Recent books covering a large range of construction types, both experimental and traditional. All levels participated. You can see a few of the books submitted below. Thanks to Dale-Cormack Pearson who took all the photography for this post.